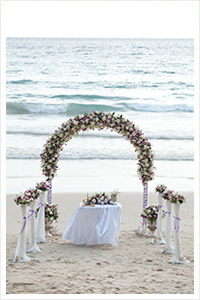 Marriage and wedding packages in Phuket. 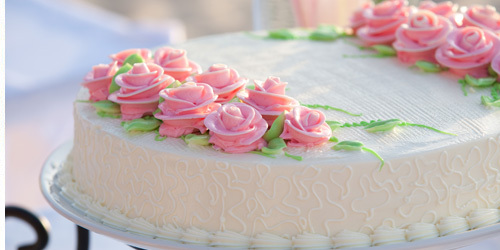 Weddings are unique celebrations with magic moments. 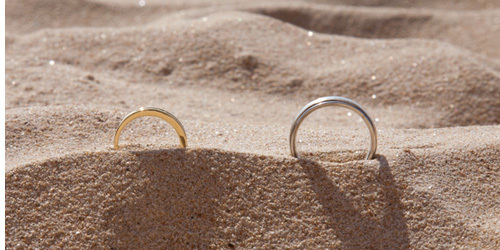 We offer romantic memorable weddings on this exotic island for couples. 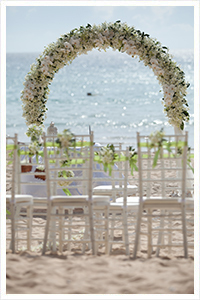 You can select our romantic western wedding or Thai style with tropical flowers. 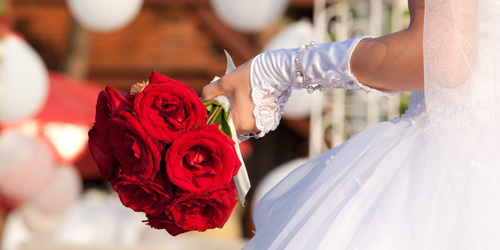 After the ceremony, you can celebrate with family and friends amidst lush greenery or in a private area. 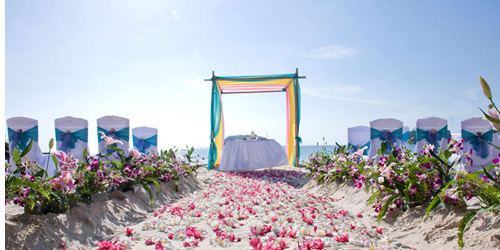 Beach wedding venue setup (Ceremony start on Patong beach, Kata beach, Bangtao beach, Naiharn beach and Layan beach). Flower archway (Pink, white, light blue and red color theme). Six white flower stands on walkway. Bouquet of bride & corsage for groom. 2 Thai Wedding garlands for wedding couple. Holy Water Pouring and Bonding Ceremony on the beach. Nice romantic photo shooting (300 shots on DVD) include photographer 4 hours. Phuket city half day tour (Chino-Portuguese Building, Phuket local food lunch, Chalong temple, Promthep cape view point, Phuket view point and Patong beach). Nice photoshooting on Kata beach. Mook Phuket (Phuket sea pearl shop). Cool towels and cool drinking water during trip. For honeymoon couple only (2 persons). Nice photo shooting (300 shots on DVD) include photographer 4 hours. Phuket city half day tour (Chino-Portuguese Building, Chalong temple, Promthep cape view point, Phuket view point and Patong beach). For family maximum 7 persons only. The payment shall be full paid of the wedding package after received invoice within 7 days. The cancellation is none refundable and can not change to cash or others. The wedding package only including as detail above. Other requirement shall be extra charged. Please fill in your wedding details. To secure your wedding date, the deposite is required. 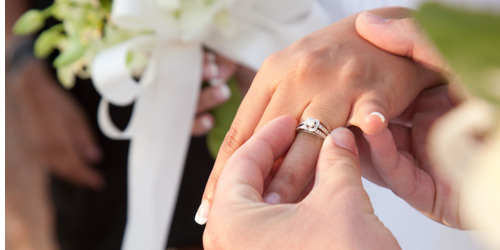 You may partially deposite at 50% of the wedding package of full paid, it is up to your convinveniencem, however, the full payment of the package shall be made within 2 months before the wedding and the cancellation shall be charged full payment. For the room booking payment, it shall be paid for 1 night every room after booking confirmation for staying quarantee. The cancellation or no show shall be charged minimum of 1 night every room booking. Please type the numeric code shown in the picture below.